Lowcountry restaurants often have items on the menu that leave tourists one of two things  confused or intrigued. One of these menu items includes She-Crab Soup. As the name suggests, this soup does contain crab, more specifically, the Atlantic Blue Crab, but there’s more to it than that. If you’ve ever gone crabbing, then you know that there is a difference between the male and female crabs. Female crabs have a triangular or rounded marking on their abdomens whereas male crabs have a pointed marking on their abdomens. To see this, catch the crabs in a net and take a look  don’t just reach into the water and rely on cat-like reflexes to be able to grab the crab and take a quick peak at their underbellies. An easier way to tell crabs apart is to look at their claws. Mature female crabs have red tipped claws (and rounded markings on their underbellies). These claw tips can be seen easily even if the crab is still in the water and prevents crabbers from getting up close and personal with the crustaceans. Another even easier way to tell if a crab is a female or not is if it has an orange sponge attached to its body. This orange sponge is actually a cluster of fertilized eggs that the female crab carries until it is released into the water to hatch. In some areas, catching and keeping a pregnant crab is illegal, but not in South Carolina, which is good considering the roe is the basis for She-Crab Soup. However, unless you’re planning on making the soup or using the roe for another recipe, it is standard practice to throw back pregnant she-crabs so that there will be future generations of she-crabs. Now back to the soup. If you’ve never had She-Crab Soup before, make it a mission in your life to try it. It’s creamy, hearty, and like virtually all Lowcountry dishes, it’s delicious. If you can’t get roe you can use crumbled hard-boiled egg yolks. If you can’t get blue crab meat, you can use any kind of crab, shrimp, or lobster. To prepare the soup, melt the butter in a heavy pot over low heat and then add flour and blend until it’s smooth. Add in the milk and half and half cream slowly while stirring constantly with a whisk. Cook the mixture until it is thickened. Add in the onion, Worcestershire sauce, salt, pepper, mace, cayenne pepper, and lemon rind. Bring mixture to a boil, but continue stirring constantly. Reduce to low heat and add in the crabmeat and roe (or substitute) and simmer while uncovered for five minutes. Do not let the mixture boil. Remove from the heat and add in the sherry while stirring. Let it sit for three to four minutes before serving. It’s fairly easy, especially if you buy the crabs and substitute the roe with egg yolks. However, using real Edisto blue crabs and roe definitely adds to it. Visit local restaurants the next time you’re in town and see if they have it on the menu. The first place I ever tried the soup was at the Old Post Office Restaurant located at 1442 Highway 174 on the island right on the bank of Store Creek (which is a perfect place for doing some local crabbing) and it’s always been my favorite. Let us know if you’ve tried it at any of Edisto’s restaurants and what you thought here in the comments section. 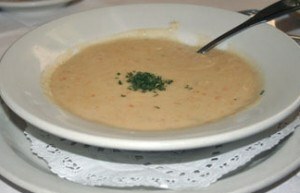 We had she crab soup in March at The Waterfront Restaurant in Edisto and it was delicious! We stayed at Edisto Beach a couple years ago for a week and went to Charleston one afternoon and ordered she crab soup. It was without a doubt the best soup we had ever tasted.